Welkom bij de international women day pagina. Dit jaar viert Sensei Kenji Shimizu het 50 jarige bestaan van zijn Tendoryu Aikido school in Tokyo. Speciaal voor deze gelegenheid zal er op 8 Maart 2019 een International Women Day worden georganiseerd. Tevens zal er op die dag een website live gaan waar de vrouwelijke aikidoka`s over de hele wereld der mate van een blog hun ervaringen zullen delen die zij hebben opgedaan binnen het aikido. Hier onder vind u de verhalen van vier ervaren aikidoka`s die al jaren actief zijn binnen het Tendoryu Aikido Roermond. Being grateful for what was. Herewith I send many thanks to Shimizu Sensei, for setting up his aikido school, for inspiring his teachers and bringing us all together within Tendoryu. 2019 became a special year for me. On the one hand celebrating 50th anniversary of Tendoryu and on the other hand saying farewell to Jos Vanroy (†). Jos was an outstanding Tendoryu aikido trainer. In 1979 he started his aikido practices. Eight years later he chose to follow Shimizu Sensei in Tendoryu. Beyond aikido he was a master in Iaido and Jodo. When I was trying to ‘escape’ the competition attitude within a local Jujutsu club and was looking for the mystical aikido harmony which I heard about, I found a school in Oldenburg, North Germany in 1995. I hadn’t yet any clue about different aikido schools. 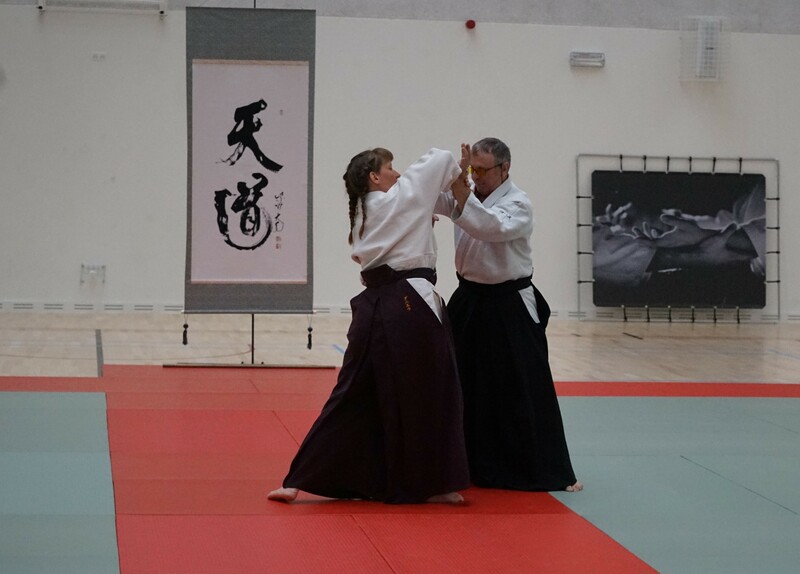 During my very first lessons I drove mad about myself – not able to perform the simple looking movements, nevertheless I took the lifelong challenge with aikido. Very soon I started with participating aikido weekend seminars and in 1996 I already met the trainer Jos Vanroy. He impressed me with his clear aikido movements, calmness, humour and figurative explanations. Immediately he became my role model for Tendoryu. When I moved to South Germany in times of low internet utilization it was not possible to find a Tendoryu dojo in my new environment. Therefore, I continued practicing aikido in dojos of Ki-Aikido and Aikikai for a short while. 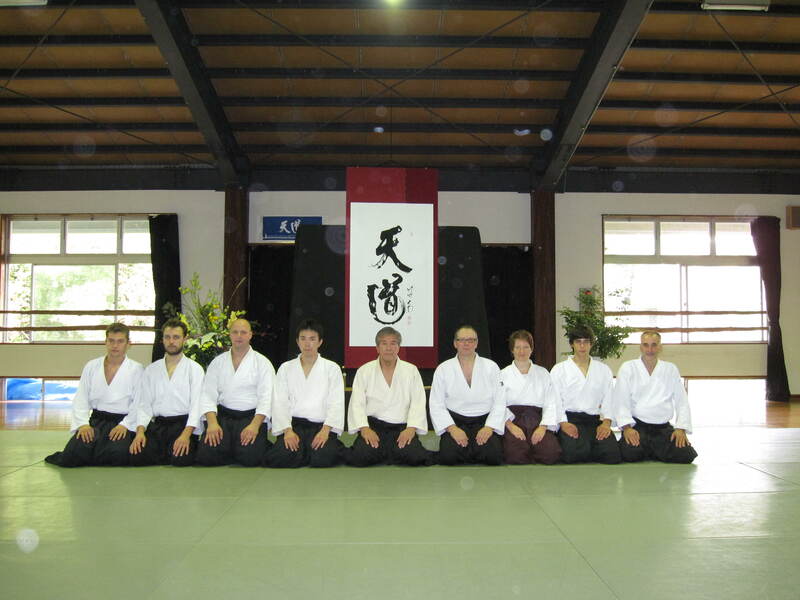 My first impressive meeting with Shimizu Sensei was at a seminar in Rüsselsheim (2002? ), Germany. When I curiously observed the aikido of this well-known Japanese person, the thought: “Wow, he moves like Jos!” hit me. I know, in fact it was the way around. I discovered one important source of Jos’s inspirations and aikido developments. It was here, where I met people of dojos ‘near’ to my city, like the dojo led by Hans Hohenadel (†) and this brought me back to Tendoryu, which felt like coming home. One of my dreams – to practice in Jos’s dojo became true when I emigrated to The Netherlands. I moved to the Dutch city Roermond, which is 1-hour drive away from Genk in Belgium. This allowed me to follow Jos’s weekly lessons for almost 10 years. Our trainers like Ludo Peters followed Jos’s lessons, too. Luckily, they taught us in our Dutch home dojo the same subjects, which kept us all in sync. More than 70 seminars I have participated were led by Jos. Summing up my major aikido experiences I am very influenced, coloured and designed by Jos. 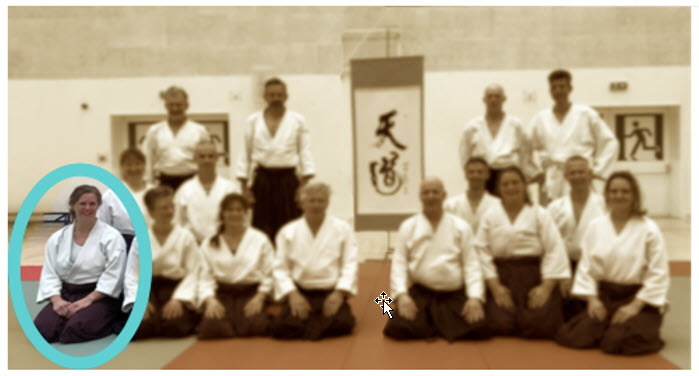 Together we travelled to seminars with Shimizu Sensei at various places in Europe and Japan. Jos became a great mentor and a valuable friend in addition. He supported me to become a trainer. Beyond thousand details Jos taught me to maintain the beginners mind (soshin) and to look continuously for universal principles. My latest lesson is to accept Jos’s very last choice in life. Being content with what is. Today I’m the first women in The Netherlands graduated with the third Dan Tendoryu Aikido. That means, it’s my duty and honour passing on the aikido experiences and taking responsibility for applying budo principles. Open for what will be. Now I’m looking forward to more women discovering the ai-ki-path for their own benefit and marked with higher graduations. I was fired in 2003 before X-mas. I’m a mechanical engineer in the process of precision mass production of the old types of beam televisions. I really loved my job, but when the LED television was introduced and the production of the conventional televisions ended. In January of 2004 I was not a working Mum anymore, but 100% at home with my two lovely sons (5 and 3 years old) together with my husband. After a few months I started missing my job and doing my expertise instead of feeding the kids, buying bread and cooking diner….I was a fulltime mother, but not happy at all. Luckily…..I discovered Aikido and got to know fine people who practicing it and learned al lot about balance and out of balance. By movements the opponent’s balance will be broken until the very moment of his fall. A year passed and Aikido became my escape of a jobless existence. It gave me energy to stay positive after many rejections. My youngest son was allowed to go to school and a day later I started a new job. As if it had to be like that :-). My agenda became fuller and the workload increased immediately, but I never find it hard to have a busy job, hobbies, family and friends. When the kids grew older and time and attention was asked in a different way, I realized that I had less time for myself. Since many parents in my neighborhood were in the same phase, we got more and more signals from people with a burn out. Some friends or colleagues suddenly became ill for a year…. very strange and scary at the same time. The few hours of Aikido that I practiced a week gave me a lot of relaxation and above all an excellent night’s sleep. After every training/workout my full head was emptied and I slept like a rose, so nice. I was aware of the balance between home and work, Aikido always helped me with this. Our Aikido association has a board of volunteers. The chairman resigned and I took over his position. The accounts were digitized and more automated, the overviews of the expenses became better. Unfortunately we had to leave the sports hall. In our region there are hardly any places available for sports between 20:00 – 22:00 h. After searching and asking for more than a year, luckily a friend tipped me and our association could use an old but beautiful location on the edge of a forest. It was nice to invest in our Aikido association and being part of the management together with the trainers. After 9 years I have transferred this function to a new chairman, because the association has to make a new step with new fresh ideas. My children grew up and are both studying now, they are strong healthy and happy young men, my loving man also started to perform Aikido. In the meantime I have been working for 6 years as a manufacturing engineer at a company that has approached me to work there. Summarized: I love my husband and children, but also my active life. I’m sure that Aikido has played a very important role in this. I’m grateful that I have been introduced to this wonderful sport, that manages to bring balance to every individual, literally and figuratively. Movement. That’s what I need.. Moving in any way. But how? I moved away in an another city on my own. I had a new job and I wasn’t in balance. A friend gave me a book about aikido. Words as harmony and training body and mind appealed to me. Everything looked so easy. While I’m working as a physiotherapist and busy with movement all day these natural movements seemed almost impossible for me. What a confrontation! It was very frustrating. I ask myself the question, do my patients also feel that way? The agreement with my work immediately made that first lesson clear. In the course of time it became clear to me that in addition to exercise, physical, other things are playing an increasingly important role to develop myself. A Dutch word helped me. It’s difficult to translate it in one word in English because it’s one word with two meanings: houding. On the one hand it means posture and on the other hand attitude. Both meanings are important for me in aikido and daily living. Aikido helps me to control difficult situations during the day. That doesn’t always work. Regular exercise is important to get progress. In this way aikido becomes intertwined in daily life. I am very grateful that I can practice aikido, especially with all those beautiful people I can train with. Deze vorm van aikido laat uitersten in mezelf bij elkaar komen. Zoals rust en energie. Bewust handelen en weten dat je kunt vertrouwen op een onbewuste reactie. Het brengt mij meer in balans. Gelijk weet ik ook dat ik mijn leven lang blijf leren, iedere les weer. Ik ben heel blij dat Tendo Ryu Aikido op mijn pad is gekomen en dat ik daardoor jullie allemaal heb leren kennen. Vanaf 8 maart 2019 kunt u meer van deze ervaringen lezen op de site van Tendoryu Aikido International Woman Day waar vele aikidoka`s hun woord zullen doen.